Personal car, taxi, train, boat, motorcycle, train, tuk-tuk, motorcycle, boat, tuk-tuk, bus, taxi, skytrain, motorcycle. Those are the modes of transportation (in order) that we took on a long day-trip out of Bangkok last weekend. My friends Eric and Kevin were in town (from San Francisco and Dubai, respectively) and they wanted to get out of Bangkok and see something new. So I took them and Eric's Thai friend Yun on the famous "Train to Nowhere" that I have mentioned before (with a few pictures of my trip two years ago), and then went to see the fireflies near the Floating Night Market at Ampawa. We started our day with a big breakfast at Bug and Bee on Silom (love those Belgian Waffles!) and then taxied over to the Thonburi train station at Wong Wian Yai. 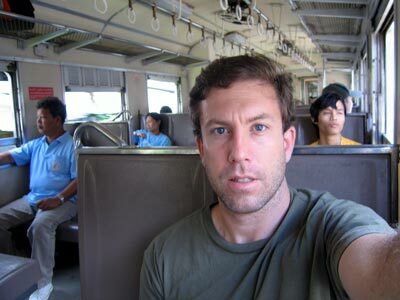 From there, the 10-baht (30 cents), one-hour train ride took us out of Bangkok to Maha Chai, in Samut Sakorn province. We exited the train in the big Maha Chai market but were only half-way to our destination. To continue the trip, we had to cross a river on a ferry, and then catch the next train on the other side of the river for another 10-baht, one-hour ride to the end of the line at Mae Klong, in Samut Songkram province. The best part about this train ride is that the end of the line goes through the middle of the the Mae Klong market. And I do mean the middle! 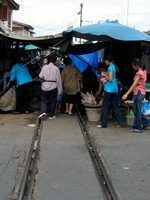 The narrow pathway through the market is actually the train tracks, and so produce and fresh meat are literally inches away from the train as it slowly passes through the stands. I took a video of this amazing "only in Thailand" event and will try to post it here soon. Unfortunately Kevin decided to head back to Bangkok at this point (I guess that was enough adventure for him) and so the three of us (Eric, Yun, and I) put him on a bus and then hailed a tuk-tuk and went for a delicious outdoors seafood lunch on the Gulf of Thailand at Don Hoi Lot. So far on this trip, I had been playing tour guide as I had been to these places a few times before. But our next stop was a new destination for me - the Anpawa Floating Market. After filling up on fish, shrimp, squid and beer, we made our way over to Anpawa on motorcycle taxis. Luckily for us, it was a holiday weekend, so there was a huge street fair in addition to the usual activities at the market. What fun! This floating market is famous for the night-time boat rides through the canals to see the fireflies. I had heard about this for some time, but this was my first chance to see them for myself. And even though I have fond memories of chasing fireflies on hot summer nights in Florida, I have to admit it was pretty cool to see them here in Thailand. All along the canal, hundreds of fireflies would be illuminating certain bushes. And the amazing thing about it was that the fireflies would blink in rhythm, making the entire bush blink on and off in perfect time. It was as if someone had strung up and plugged in some Christmas lights. The only problem with our trip was that we were not really sure exactly how we were going to get back to Bangkok. Around 7:30 PM, someone told us that the last bus went back at 7. Opps. But mai bpen rai we decided to live in the moment and worry about how to get home whenever we were ready to go. And amazingly, a few hours later, it worked out fine. We just caught a tuk-tuk out to the main highway that leads to southern Thailand, and waited for about 10 minutes before waving down a bus on the way to Bangkok. Of course, when I am in a bus on a long road trip, I hate it when it stops to pick up random passengers on the side of the road. Just take me to my destination ASAP please! But this night, for once, I was glad that hitch-hiking on buses is possible in Thailand. The first video was taken from the big Chinese Temple and is looking out over the Gulf of Thailand back towards the mainland. Ko Si Chang is about 10 kilometers from Thailand's biggest port at Laem Chabang. It was amazing how many huge ships were docked here. The 47-second video below shows some of the ships, and the main town of Ko Si Chang, and finished on the boat pier where I missed my first ferry and had to buy another ticket for the second one. In the background, you can hear monks chanting from the Thai temple below the temple I was in. You can also here the constant din that all of the boat traffic is making. It's definitely not as peaceful here as when King Rama V came here for rest and relaxation! Once on the ferry, I witnessed something I have never seen before. There were several young boys (around 10-12 years old, perhaps) playing in the water around the boat. They soon started yelling at the passengers to throw coins into the water. When the coins were thrown, the boys would dive for them. Each one of them must have made 30 baht (US$1) or so. Not bad for fun and games when you're 10. Here's a ten second video of a couple of the boys competing for the sinking coins. The first boy gives up, but the second boy stays under a bit longer and comes up with the prize. We got an early start today, as Piyawat had an early flight to Phuket for a business trip. I dutifully took him to the airport, and then hit the road to do some sightseeing for the day. And let me just say this: Highway 7 that starts at the end of Rama 9 road and goes past the airport and on towards Pattaya is without a doubt the best road in Thailand. It's so nice to drive at normal "highway speeds" and not worry about noodle carts or dogs or chickens or little children to run out on front of your car. The two 30-baht (US$1) tolls I had to pay were well worth it! My first destination was the island of Ko Si Chang, which is located off the coast of the town of Si Racha, about 100 kilometers from Bangkok. The island was the favored get-away resort of King Rama V, who ruled Thailand from 1868 to 1910. The King built a huge golden teak palace here. After the French took the island in 1893, he ordered the palace to be dismantled and moved to Bangkok, where it is now called the Vimanmek Mansion. According to various websites, it is the largest golden teak building in the world. I can't imagine how many millions of dollars it would cost to build today. I learned all of this from museums that are setup in various 100-year-old Victorian style buildings spread around the palace grounds. I had had a great time exploring and reading about the turn of the century (1900s, that is) royal family. I continued on my hike up and down the mountainous terrain of the island, visiting a few beaches along the way. I more or less walked continuously from reaching the island at 10 AM until I left at 5 PM. And I have to say that the island was much more beautiful and peaceful than I expected. It was a very cloudy day, so I also was not expecting to get a sunburn on my face and neck. I stupidly forgot to wear the hat I was carrying around, and only later in the evening did I realize my mistake. I am definitely kicking myself for that! There was more that I wanted to explore, but around 3:00 PM (after five hours of hiking the mountains) I started getting very tired and decided to head back to the mainland. I bought a 60 baht ($US 2) ticket for the ferry and asked when the ferry was leaving. I was told 4 PM. Perfect, I thought. I'll go rest my weary legs and drink a beer to ease the pain. I was back at the pier feeling much better at 3:50, only to be told that the boat had already left. The next boat was at 5:00. Feeling energized (or is it numbed?) by the beer, I decided to visit the huge Chinese style temple on top of the mountain next to the pier. And I have to say I am glad I had the chance to go, as it was an interesting temple and had the best views of the island. Not taking any chances, I was back at the pier at 4:40. But when I showed my ticket I was told that it was for a different boat company. Their next boat left at 6:00. But if I wanted to go now, I would have to buy another 60 baht ticket. By this time I was really ready to go, so I just smiled and shelled out another 60 baht. And unbelievably, the boat left the pier at 4:45 -- fifteen minutes early. So, if you ever go to Ko Si Chang, make sure you buy the right ticket, and make sure you are at the pier early! Eventually we made it back to the mainland, and I drove another 30 kilometers to Pattaya, where I ate at my all-time favorite Italian restaurant in Asia. Their specialty (or, at least the dish I always order) is Pasta Carbonara and it is absolutely heavenly. It is so rich that there's no doubt I went back to Bangkok a few kilos heavier. I left Pattaya at 9:30 and was back at the airport to pick up Piyawat by 11:00. (Again, thanks to that awesome highway!) I was exhausted and sore and sunburned, but so very fat and happy after a great little day-trip. 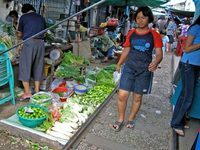 Over the last few decades, the Gulf of Thailand just south of Bangkok has been eating up land at a rapid rate. 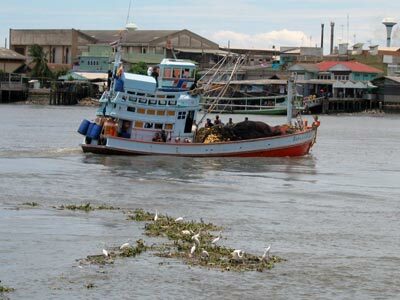 The people of a small village on the coast, Ban Khun Samut Chin, have had to move their homes further inland several times to escape the encroaching water. The village temple, Wat Khun Samut, is still in operation in its original location, although water sometimes laps against its walls during high tide. The monks also had to raise the floor of the temple about a meter to keep it dry at all times. Some point to global warming as the cause of the "rising ocean", but part of the problem is that people have cut down all of the mangrove forests that kept the soil in place. And add that to the common problem of eroding land at the mouth of a big river (like in New Orleans) and you have an ocean shoreline that is steadily moving closer and closer to Bangkok. Back in September, Piyawat and I decided to see this for ourselves, so we headed over to Samut Prakan, Bangkok's provincial neighbor to the south, to visit the temple in the middle of the ocean. Our tour guide for the day was Richard Barrow, the webmaster of an incredible set of websites called Paknam Web. I have been reading his blog and visiting his sites (like the excellent Learning Thai Language site) for a long time, so it was great to finally meet him in person. In any case, at the time, I never got around to writing about our little trip, so I will let Richard's description and photos fill in the blanks. If you want to read more, you can see many of his blog posts about the village and the temple, with some very interesting photos of the temple. Here I am at the start of the journey at Wong Wien Yai station in Thonburi. Note the light blue shirts being worn in the background. They are commemorating the Queen's Birthday today. 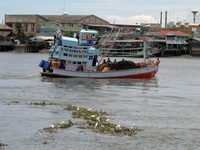 This river at Mahachai is very close to the Gulf of Thailand, and so there were many fishing boats like this one. I was also trying to take a picture of the birds who were standing on floating plants in the middle of the river. 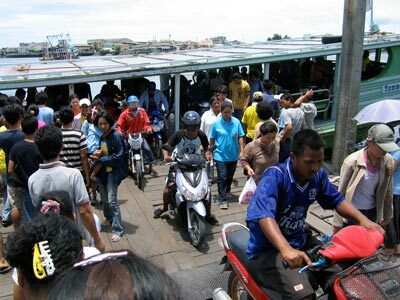 A look at the chaos of getting on and off the ferry across the river. And yes, you are allowed to bring your motorcycle on the ferry as well. 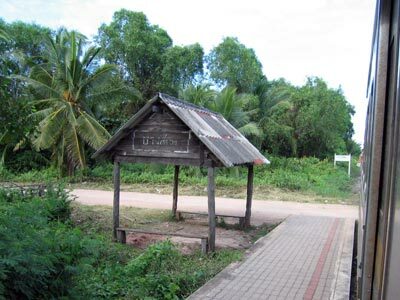 The end of the line at Ban Laem station. The train shown here is waiting to take me to Mae Klong, Samut Songkram province. 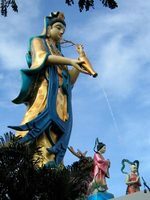 The first stop after Ban Laem station is at this temple, with a huge statute of the Chinese goddess Kuan Yin pouring water out of her vase. Her two acolytes, Long Nu and Shan Tsai, stand in front of her. When the train is not using them, the tracks become a foot path between the produce and seafood stalls. Be sure to wash those veggies when you get them home! Amazingly enough, these are the tracks that the Mae Klong train uses. When it's time to leave the station, the vendors hold back the overhead tarps to make room for the passing train. One of the tiny stations along the way is nothing more than a rain shelter. A dirt road leads from the tracks to the village. 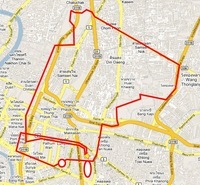 "I recommend taking the secret train to no where," my friend Kary confided to me yesterday over lunch on Silom. I guarantee you will be the only farang around. It's a great day trip to get out of the city." I had heard of the secret train to no where, a.k.a. the Mae Klong Railway, before, but I had never had a chance to ride it. 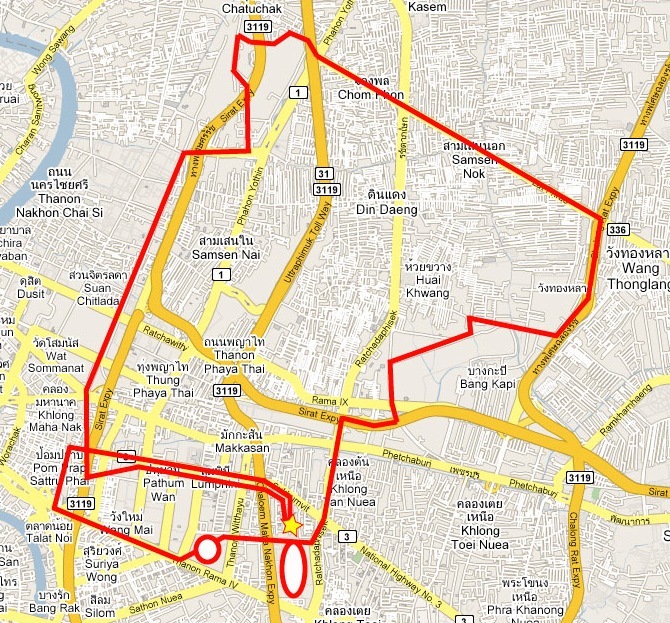 So today, to celebrate Thai Mother's Day, I journeyed from Bangkok to Mae Klong on this historic route. The secret line starts at a tiny station near the Wong Wien Yai traffic circle in Thonburi, across the river from Bangkok. There are no signs in English, so to find the station one must walk south from the traffic circle and peek down narrow alleyways until the tracks are visable. The open-air train leaves more or less every hour and one hour and 10 baht later, riders will find themselves at the other end of the line in Mahachai, Samut Sakhon province. But the end of the line is not actually the end. Two hundred meters from the Mahachai train station is a river, which can be crossed on a ferry for 2 baht. On the other side of the river, 500 meters from the pier is another tiny train station, called Ban Laem. 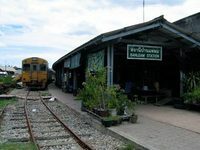 The trains leave Ban Laem four times a day and take riders an additional hour through the countryside to Mae Klong, Samut Songkram province. The cost for this trip is 10 baht as well. To be honest, there's not a whole lot to see on these trips. But feeling the cool breeze blow in through the open train windows as we pass grey-water klong (canals), rice farms, salt marshes, palm tree jungles, tiny villages, and very active temples is worth the trip alone. Many people along the way use these trains to commute to the huge produce and seafood markets at each end, so it was fun just to sit back and watch them interact with each other. Perhaps the most interesting part of the entire trip is at the very end. The tracks run make a tight squeeze through the middle of a market. The squeeze is so tight, in fact, that as the train approaches, the vendors have to pull back the tarps over their produce so the train can pass. Once the train is in the station, everything goes back to normal and the train tracks are nothing more than a narrow path between stalls. And then basically the same thing back, without the mototaxi, now that I knew where I was going. So that's a full-day trip to see "real-life" Thailand outside of Bangkok, for a total of 82 baht, or US$2.10. Now that is a great deal. So we'll call it a full-day trip with a great dinner for 10 bucks. Anyone want to join me next time? This page is an archive of recent entries in the Day Trips category.